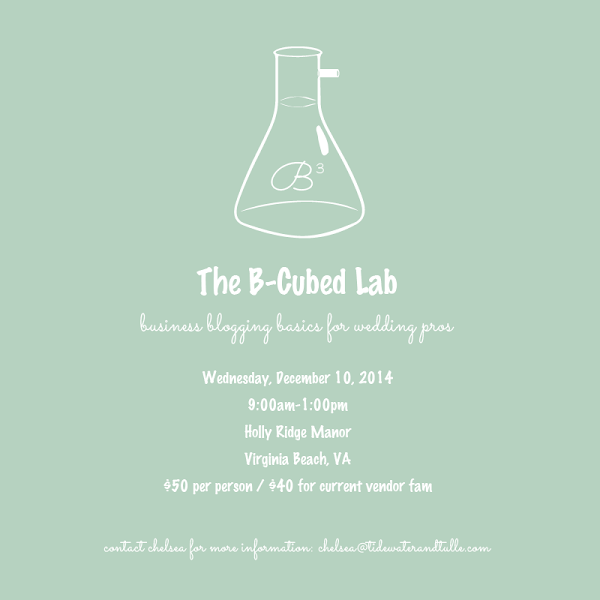 After quite a few emails from Tidewater and Tulle Vendor Fam this past year and after being on Richmond NACE's Bloggers Panel last month, I learned a lot of wedding pros were hungry for some real blogging advice for their own businesses. While a professional wedding blog might differ in purpose and daily structure than a wedding professional's business blog, the formula really is the same. We want results, we want to reach our target audiences, and we want it to be useful and productive, and we want to truly showcase who we are as business owners on professional and personal levels. So how do we do it through our wedding brand's blog? Well, blogging for your business is actually rather formulaic. While it lends itself to a great creative outlet, there is a basic structure that is tried and true. No hypotheses here! And we'll be going through this and more in the first The B-Cubed Lab workshop next month! * No need to bring a laptop this time! B-Cubed is purely informational, and you'll be able to apply your theories afterwards in your respective laboratories. * Questions! We'll have multiple times for Q&A. Head over to the Registration Page for snag your ticket. Spots are limited to 20. Look forward to creating sparks and sharing data!